Unfortunately, red wine stains are notoriously difficult to remove despite how commonly they happen. The pigments of the red wine soak into fibers and begin to set almost right away. That is why it is important to act quickly and treat the stain immediately. There are some first steps you can take to help achieve a successful outcome, and then five different treatments to try if there are still signs of red. 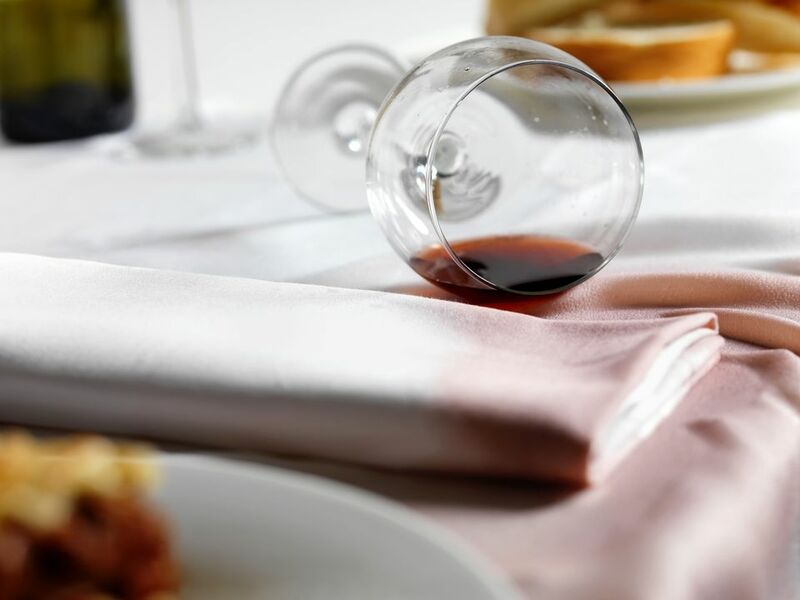 If at all possible, try to treat a red wine stain immediately; the older a stain is, the more difficult it is to remove. The first step is to blot the stain with a clean cloth or paper towel, making sure you are pressing down gently (dabbing) and not rubbing—scrubbing will set in the stain. Then apply some kind of treatment to the stain; the method you choose will depend on where you are and what supplies you have on hand. Just make sure you don't put the clothing in the dryer before the stain is removed; the heat will set in the stain and make it almost impossible to clean. Common salt can remove red wine stains from fabric. The grains of salt absorb the wine, pulling the color away from the clothing and acting as a cleaner while mildly scrubbing the fabric to loosen any remaining stain. After you blot the stained area with a clean cloth or paper towel, sprinkle salt onto the stain and allow it to sit for two to three minutes; the salt should start to absorb the red wine. You also can leave the salt on overnight (leaving the salt on longer is more effective). Then rinse thoroughly with cold water. If the stain remains, you can repeat the steps. If the fabric of your clothing is somewhat sturdy, like heavy cotton, try pouring boiling water over the salt. First, place the fabric over a bowl so the stain is centered; if need be, you can secure the fabric with a rubber band. Then, carefully and slowly pour the boiling water over the wine spot from about 8 inches above to allow the force of the water to push out the stain. If you are satisfied with the results, launder as usual. If not, repeat or try something different. You can also use this boiling water method without the salt. Many people swear by this stain removing method and for good reason. Pour a bit of the carbonated drink over the stain and allow the clothing to sit overnight. While you can swap club soda for seltzer when making a drink, the two aren't chemically the same, so use club soda for stains. In this two-step process, first, cover the stain with white vinegar and then apply liquid detergent. The vinegar neutralizes the red and purple pigments in the wine while the detergent cleans the fabric. Launder in hot water until the stain is gone. Try a few professional products. Soaking the clothing in OxiClean powder mixed with the warmest water your fabric can handle is a good option—red wine is one of the stains the solution promises to remove. Other proven choices include Carbona Stain Devils, Bac-Out Stain, and Odor Remover, Ecover Stain Stick, Spot Shot, and Tide Stick. There also are a few sprays made specifically for removing red wine stains such as Chateau Spill and Wine Away. If there was a red wine stain you didn't get to in time or didn't know about, you may still have luck getting it out. Old red wine stains need a good long soak in cold water to have a chance of removal. Start by rubbing liquid laundry detergent or dish soap on the stained area. Next, put the clothing in a bowl or bucket of cold water to soak for 30 minutes. Apply a stain remover and wash the piece of clothing on a normal cycle. Repeat these steps until the stain is gone or no difference is being made. For really tough stains on white clothing, you can use a bleaching agent. For colored clothing, a non-chlorine oxygen bleach might be helpful, too.